When a Timer Intermediate Event is used within the normal sequence flow as a standalone element, it acts as a delay mechanism. In this section, we create the Configuration Artifact, specify the model Package and configure the parameter values of each element. Then all the BPMN elements will be loaded in to the 'Configure BPSim' dialog. 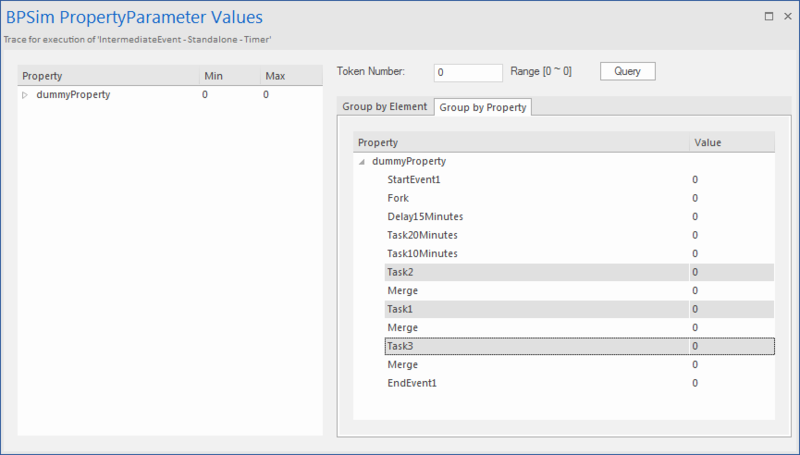 With this property, the 'Property Trace' dialog will be able to show the sequence of element flows during simulation. This order is determined by the BPSim parameters set on two of the Activities (ProcessingTime) and the Timer Intermediate Event (InterTriggerTimer). The sequence shown in the 'BPSim PropertyParameter Values' dialog confirms that Task2 comes ahead of Task1, which comes ahead of Task3.